CIYMS captain Nigel Jones. 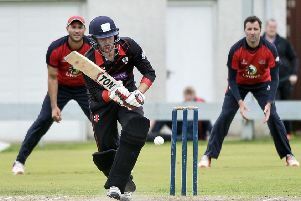 Pic by PressEye Ltd.
CIYMS have only lost one 50-over game since their opening-day league defeat to North Down - and that came in the Irish Senior Cup against Merrion. Waringstown haven’t lost a single game in this format since April 28, winning four league matches, two Irish Cup games and making it to this stage of the Challenge Cup. The pair will meet tomorrow and CIYMS captain Nigel Jones feel his side have been building momentum of late. “The good thing is that we do feel like we are building momentum now,” he said. “That North Down loss gave us the kick up the backside that we needed, and the Merrion defeat recently was a tough one to swallow but that happens in cricket. “Sometimes you get close and can’t get over the line, and we know it was because we coughed up a few extras in that game. “We spoke about that and bounced back with a good performance against Muckamore. “We have spoken about putting in a performance that was more effective and trying to boss the game. “The wins we have this year, we have won well. The Belfast side have one of the most potent bowling attacks in the Union, with Jones himself possessing an average of 9.53 and an economy of 2.87, both of which are the best of any player in the NCU. He is supported by Allen Coulter, who has taken 24 wickets in 11 matches - and the spinning triple threat of Jacob Mulder, Trevor Britton and James Cameron Dow. Add to that the pace of Matt McGillivray and David Robinson, it shows their quality and Jones says it is a tactic to attack the opposition early. “It’s a bit of a tactic to try and attack the opposition early, whether it’s taking wickets or keeping it really tight,” he added. “We have been putting it in a good area and taking wickets which puts the opposition on the back foot. “It allows the likes of Matt, who is a very skilled bowler and is very hard to get after, to come on and he tends to take wickets as soon as he comes on. “The spinners like Mulder, Cameron Dow and Britton have been terrific. “We also have young Robinson too. “We have seven or eight bowlers who can all do a job and all can do very well. They beat Waringstown twice in the league last season, and Jones says his side know they have to produce their best against the reigning Irish Cup champions. “There is no doubting that Waringstown’s results and the blokes on their team-sheet speaks for itself,” he said. “They are proven in terms of a team and we know it’s going to be a big battle. “We did say that you have to beat them at some point, so why not do it now and get us into that final. “When we are playing against any of the big teams, we know we have to play good cricket to give ourselves a chance of winning. “If we do that, then I would say the odds are in our favour with the calibre of team we have. Waringstown are used to playing in these big matches and captain Greg Thompson says occasions like Saturday are why his team train so hard. Both sit joint-top of the Premier League on 16 points, but Thompson sees this as a one-off match that has no bearing on anything else. “I think it is just a one-off game,” he added. “I don’t think one win or defeat does anything more outside of that weekend. “We will very much be looking at it if we win or lose on Saturday, we are still in a very strong position in the league and in all the cups and hopefully we are sitting in a final by the end of Saturday. 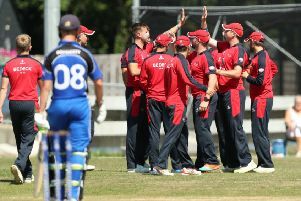 July is a big month for both sides, with the pair meeting again in a Twenty20 Cup semi-final and four league games that will help determine who wins the title. Waringstown also host Pembroke in the Irish Cup quarter-final on July 15, but Thompson says his side are used to a busy calendar.